Jakarta, (UrduPoint / Pakistan Point News - APP - 17th Apr, 2019 ) :Indonesia's Joko Widodo was on track to be re-elected as president of the world's third-biggest democracy Wednesday with pollsters giving him a wide lead over rival Prabowo Subianto, an ex-general. 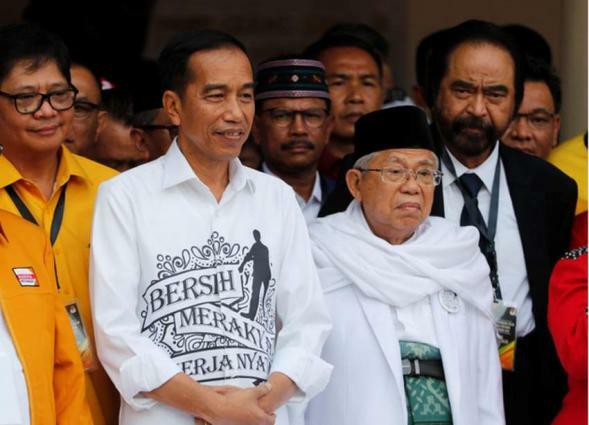 Based on data collected at polling stations, Saiful Mujani Research Centre, Indo Barometer and Indikator Politik Indonesia put Widodo at about 55 percent of the vote against Prabowo's 44 percent. UAE girls power to glory in Abu Dhabi world Youth ..
King of Bahrain orders reinstatement of citizenshi ..
AED39 bn in cash dividends paid out by listed Emir ..
FNC, Russian Duma discuss parliamentary cooperatio ..
Dubai forecasts 2.1% real growth in 2019, 3.8% in ..